On the fourth day of our family trip, Danny and I brought them to Gyeongbokgung or Gyeongbok Palace (경복궁), the biggest among 5 of the palaces in Seoul. In English, Gyeongbokgung (Hanja: 景福宮) means The Palace of Shining Happiness. Another name they call it is The Northern Palace due to its locality. Moreover, it is one of the most visited tourist spots in the capital. A great place to strengthen those hamstrings, too. It was built in 1395 during the Joseon dynasty and had been destroyed by fire, but King Gojong was able to restore it during his reign. I won’t elaborate more of its history because it’s quite long, repetitive and probably boring to some. To learn more about the palace, please visit their website. Link is at the bottom part of this post. Hooray! It’s 2016. How was your Christmas holiday, by the way? I hope it was festive and fabulous. Danny and I had a terrific time despite our simplified merry makings and Christmas eve dinner. We didn’t have the fabled white Christmas but, we experienced a Christmas-y spirit in a Korean way. I enjoyed the decors at Millennium Seoul Hilton Hotel (밀레니엄 서울힐튼호텔). Every Christmas season, they set up their gigantic and dazzling tree along with some miniature Christmas trains. 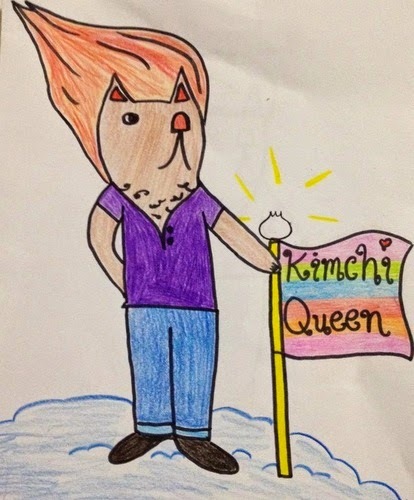 2014 was a great year for The Kimchi Queen. Although I was out of country for half of the year, I still was able to write often enough, and almost (almost!) reached two million views. So, what were the most viewed posts of 2014? Moving to Korea is quite an adventure and while you will gain invaluable experience while you're here, whether you're enrolled in a language school, teaching English or simply backpacking across the country, writing a blog is one of the best things you can do to document your journey. But your blog doesn't have to be just a diary to keep track of your day-to-day life. In fact, there are a number of benefits to writing a blog, some more valuable than others. Read on to see what you can gain from blogging.